Fadi Alfayoumi is a skilled and experienced cardiologist caring for the Brownsville, TX community. Dr. Alfayoumi obtained his medical degree from the Jordan University of Science and Technology Faculty of Medicine. He completed his residency in internal medicine from Temple University, Western Pennsylvania Hospital. He also completed his fellowships in interventional cardiology and cardiovascular diseases from the same institute. 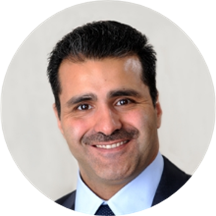 Dr. Alfayoumi is a part of the Heart & Vascular Clinic and is affiliated with Valley Baptist Medical Center in TX. He is board certified by the American Board of Internal Medicine, the American Board of Clinical Lipidology, the National Board of Echocardiography, and the American Board of Vascular Medicine. He is a member of the American Heart Association, the American College of Cardiology, the American Society of Echocardiography, the National Lipid Association, and the Society for Cardiovascular Angiography and Interventions. He was recognized as the best resident in internal medicine department at the Western Pennsylvania Hospital and champion of the state of Pennsylvania in ‘Doctors Dilemma Competition’ sponsored by the ACP in Pittsburgh. Dr. Alfayoumi gives each patient his focused attention, and he prides himself on delivering the best treatment available. He is dedicated to helping patients receive the treatment they need so they can enjoy a positive and fulfilling lifestyle.